Lorraine Ottens started making lacto-fermented sodas a year and a half ago. She and her farmer fiancé Nigel Walker of Eatwell Farm tasted one of these unusual beverages at the Wise Traditions conference hosted by the Weston A. Price Foundation. Lorraine Ottens started making lacto-fermented sodas a year and a half ago. She and her farmer fiancé Nigel Walker of Eatwell Farm tasted one of these unusual beverages at the Wise Traditions conference hosted by the Weston A. Price Foundation. “I’ve never liked the taste of kombucha and I’m not a soda drinker, but this was refreshing, delicious and, on top of that, good for you,” she says. Lorraine sought out a recipe and found one for “cultured coolers” in (former CUESA staffer) Jessica Prentice’s book, Full Moon Feast. After following it once, she began to experiment with batches for her family. She liked the fact that the lactofermentaion helps the body form digestive enzymes and create essential fatty acids. And, because they contained salt, the drinks made for a useful source of electrolytes. “Nigel pointed out that it would make a great value-added product at the farmers market,” Lorraine recalls, “so I started playing with adding anything and everything we had around the farm.” She mixed a fizzy base of fermented whey, sugar, and salt with water and juice from fruit that was growing on the farm. She also soon added the aromatics – the lavender, rose geranium, lemon verbena, and rosemary — Eatwell uses for its herbed salts and hydrosols. 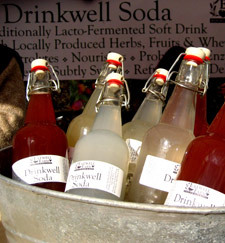 Lorraine debuted the line — Drinkwell Sodas — at the Eatwell Farm stand at the market last summer. “I noticed people weren’t applying the same approach to drinks that they were to their food,” says Lorraine. She started making these alternative sodas because she wanted people to think about buying organic, healthy and local when they shopped for drinks, too. Drinkwell sodas bridge that gap: all the fruit that doesn’t come from Eatwell is sourced from other local farmers, such as pomegranate from Twin Girls Farm and blueberries from Lagier Ranches. Lorraine started out using leftover whey from Spring Hill Cheese Company, but she eventually switched to whey she makes herself using Straus yogurt because it contains Lactobacillus, a beneficial bacteria. “The goal of the drink is to offer something that is softer and kinder on the body and softer on the environment,” she says. In addition to the local ingredients, Lorraine has also taken an eco-friendly approach to packaging. She sells the softer by the glass and in re-usable glass bottles that she makes available for $1 deposit. She also encourages her customers to bring the bottles (or a container of their choice) back for refills at $.25 an ounce. She ferments the drinks on Thursdays and takes them out to put on ice by Friday afternoon, so that by the time they’re ready to be served on Saturday, they taste fresh and fruity. Customers who like the beverage less sweet can allow it to ferment further (Lorraine herself prefers it this way).